Banda Aceh, the capital of Aceh Province, is one of the medium sized cities with the population around 259,913 inhabitants . As with many medium cities in Indonesia, to date, the city has been urbanizing speedily and has experienced considerable changes in growing economy and motorization. Modern motorized society faces several externalities due to traffic congestion such as unwarranted travel times, air pollution, unnecessary energy consumption, and driver frustration . These congestion-manifested problems have also extended to the city of Banda Aceh as extraordinary growth in motorization has taken place. Accordingly, the government of Aceh needs to act strategically to deal with motorization related problems. The Trans Koetaradja now is under trial runs, a free of charge service is applied within running corridors. If this proposed bus system would succeed, then the Bus Rapid Transit (BRT) system will be applied in the next planning step. Studies have shown that bus reform policy such as BRT has appeared as a cost-effective public transport alternative with noteworthy possibility for Jakarta [3, 4]. Besides, providing appropriate of the public transportation will deliver the effectiveness in reducing congestion related problem such as cutting down CO2 emissions, increasing the efficiency of fuel use, as well as make the society more equitable regarding mobility [5, 6]. Approaches to developing public services that would perform well could be taken into consideration in the comprehensive transportation planning policy . Encouraging and improving public transportation could get more extensive attention and become a critical issue in developing countries. Furthermore, Fujii and Van  also recommended that the solution can be provided by combining among “hard policy” measures such as improving the quality services and the “soft policy” measures such as changing travel behavior by adopting mobility management. It is observed that travel behavior changes are substantially related to psychological motivations. In this regards, there are countless studies attempting to comprehend the subjective intentions that affect the public in supporting specific transport policies. For instance, Eriksson et al. verified that the individual’s subjective indicators related to problem awareness, policy fairness, and perceived effectiveness are documented as a vital aspect distressing the acceptability of transport pricing proposal. Furthermore, Fujii  and Gärling et al. established that the emotional intention related to infringement of freedom, policy fairness, problem awareness, and perceived effectiveness have directly and indirectly contributed to the acceptance of the policy. These psychological aspects indicate that a wide range of psychological motivations explains the acceptability of transport policies. In the context of developing country perspectives, Sugiarto et al. [11-13] scrutinized citizen’s choice behaviors by taking into consideration observed and unobserved variables. They revealed that unobserved factors namely recognition to the proposed policy, the fairness of the system, awareness of the congestion-related problems and inhibition of freedom of movement have significant encouragement on acceptance’s determinant to transport pricing measures in Jakarta. Moreover, Joewono and Kubota  revealed that there is a substantial association between global satisfaction and devotion to use public transport services. An investigation by Fujii and Van  found that the psychological determinants to the habit of using bus system in Ho Chi Minh City (HCMC) city were unobserved factors such as moral concerns and the perceiving of the service quality, and they concluded that grounded on psychological variables, the mobility management actions may well be functional in encouraging people to use the bus. Given the above background, two hypotheses were made in this study. We hypothesized that (1) perceived appropriateness of the policy and awareness of the problem of private mode of transportation would have a positive effect on their intentions to support proposed policy; (2) determinant of private mode dependency and inhibition of freedom of movement/less accessibility of the bus would have an adverse consequence on such intentions. Consequently, this study looks at the citizens’ subjective response to the acceptance from the public regarding proposed Trans Koetaradja. Revealing travel behavior of private mode users using psychological approaches is crucially important to develop better mobility management in private mode dependence city. With this, an enthusiastic experimental investigation of citizen’s intention to receive the bus reform policy by seeing an emotional influence is obtainable in this study. This effort might be of precise assistance in designing a more efficient policy for the advancement of a bus reform policy by capturing some of the intelligent communication strategies for the development of mobility management. To conclude, a healthier thoughtful of local characteristics approach, such as understanding the effect of motorized traffic in a particular effect of motorcyclists on the demand of trip, is essential for successful transport policy measures for the betterment of the society [15, 16]. The Stated Preference (SP) experimental of Louviere et al. [17-19] has been implemented in our study. The SP method is extensively used in transport modeling particularly to analyze travel behaviors [20-22]. The SP was employed to design a questionnaire survey in this work. The target respondents were commuters, commercial visitors and employees within Trans Koetaradja lines. It should be noted that the questionnaire was distributed among bus riders and people who live in the surrounding area within the bus lines. The proportion of the targeted samples of respondents can be seen in Table (1). 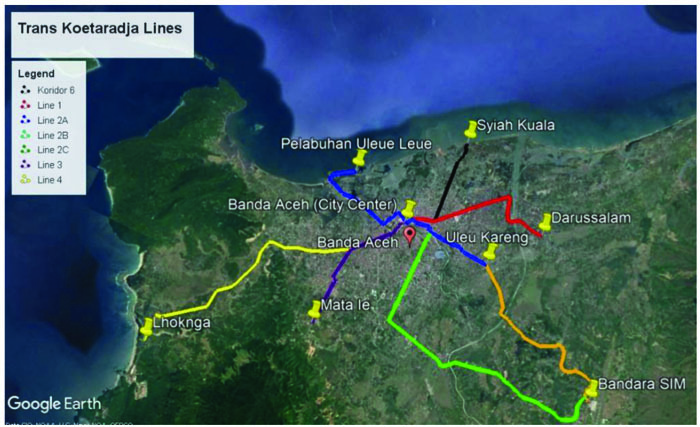 The Trans Koetaradja trial run is within the city of Banda Aceh, as shown in Fig. (1) The target area of this study is line number 1 (red), 3 (dark blue), and 4 (yellow) of Trans Koetaradja, as shown in Fig. (2). Above mentioned bus lines are major urban roads that experience traffic congestion, particularly during peak hours. A paper-pencil based questionnaire survey based on the direct interview was conducted in late 2017 and early 2018 in Banda Aceh. The questionnaires were distributed to 870 participants, and a total of 450 questionnaires were valid and used in this study. The preliminary analysis of the data set has been done and published in the previous study [18, 19]. Table (1) gives our experimental information such as time of collecting data, survey location, sampling number and distribution of the samples. Fig. (1). 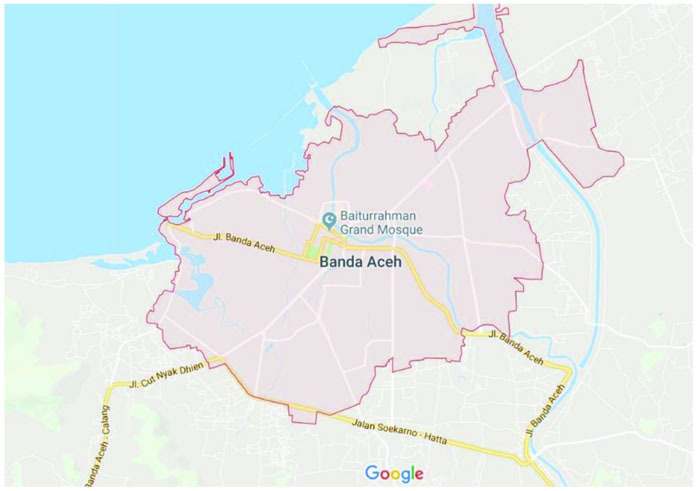 Banda Aceh city (map data © 2018 Google). Table 1. Summary of the questionnaire survey. Fig. (2). Trans Koetaradja Lines (overlay on map data © 2018 Google). Table 2. Distribution of respondents’ socio-demographic characteristic. We implemented SP survey form in order to gain comprehensive and appropriate information from our target respondents. Therefore, the questionnaire form was designed as simple as possible for gaining more cooperation by the citizens. As mentioned earlier, the context attitudinal questions in this study were adopted and modified by the previous works [11, 12]. Therefore, in this study, the most pertinent inquiries were designated to attain (i) attitudinal indicators toward the acceptance of bus reform policy, (ii) attitudinal indicators related to perceived appropriateness of the policy, (iii) perceived awareness of problem private mode in society, (iv) private mode dependency, and (v) inhibition of freedom of movements. 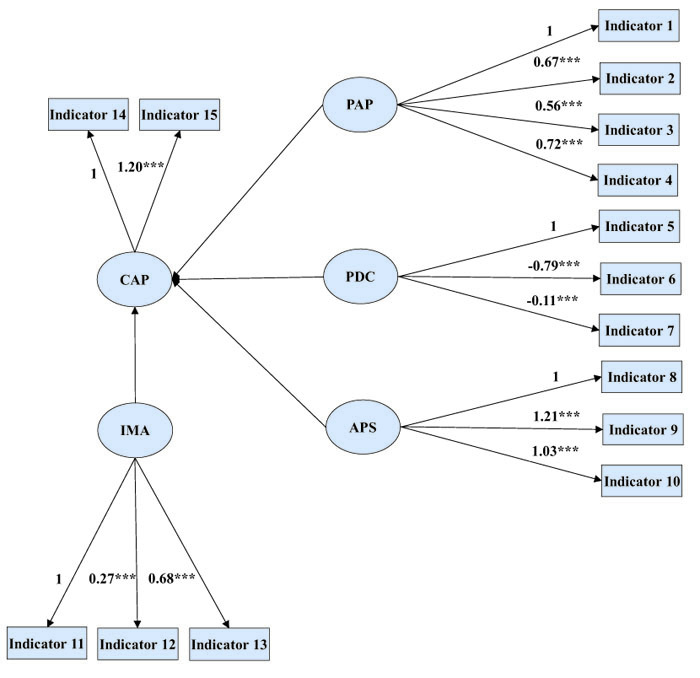 A Structural Equation Modeling of Confirmatory Factor Analysis (SEM-CFA) method is implemented to delve more deeply in the respondent’s psychological intentions. Jöreskog  defines two types of analysis based on common factors namely Exploratory Factor Analysis (EFA) and CFA. CFA is a category of Structural Equation Modeling (SEM) that promises unambiguously the measurement of relationship (measurement models) such as relationship among indicators (e.g., test items, test scores, behavioral observation ratings) and latent variables . The central concern of CFA is modeling factors or latent variables that are not directly measured but manifestation from psychological perceptions or indicators. In this study, SEM-CFA parameters were achieved using IBM AMOS version 24. We used Maximum Likelihood Estimator (MLE) to estimate path coefficients of indicators and latent constructs. We used different fit indexes to test the model: the Root Mean Square Error of Approximation (RMSEA = 0.059), the Adjusted Goodness of Fit Index (AGFI = 0.915), the Comparative Fit Index and the Tucker-Leis index (CFI = 0.939, TFI =0.972), and χ2/degrees of freedom (χ2/df = 2.58). The fit indices demonstrate a substantially acceptable model [11, 12]. Regarding latent constructs, Fig. (3) depicts the association between indicators and latent variables (i.e., PAP, PDC, APS, IMA, and CAP). Observinging the latent variable of PAP, the indicators of “correct policy to deal with motorized traffic Acceptable policy”, “the government has given an understanding of the policy” and “appropriate policy to reduce congestion” has a positive value at 1% level of significance. It is acknowledged that these latent variables would entertained as an advancement in the acceptance of such policy. Looking at the determinant PDC, the indicators of “like to drive private-mode (car or motorcycle)” and “public transport is expensive and has a limited route” are pointedly negatively signed in the data set. These sign representing the latent construct of PDC would diminish acceptance of the proposed policy. Table 3. Distribution of the intention to accept the bus reform policy. Table 4. Description of latent variables and psychological indicators. Fig. (3). Diagram of SEM-CFA: loading path among latent variables . (ellipses) and indicators (rectangular); all path coefficient significant at 1% error level. Fig. (4) Depicts the causal relationships and their strength among the acceptance of latent variable and psychological determinants. The latent variable of “Perceived Appropriateness of the Policy (PAP)” and “Awareness of problem private mode in society (APS)” have shown the most substantial effect, and it has a significant contribution in the acceptance of the proposed policy. 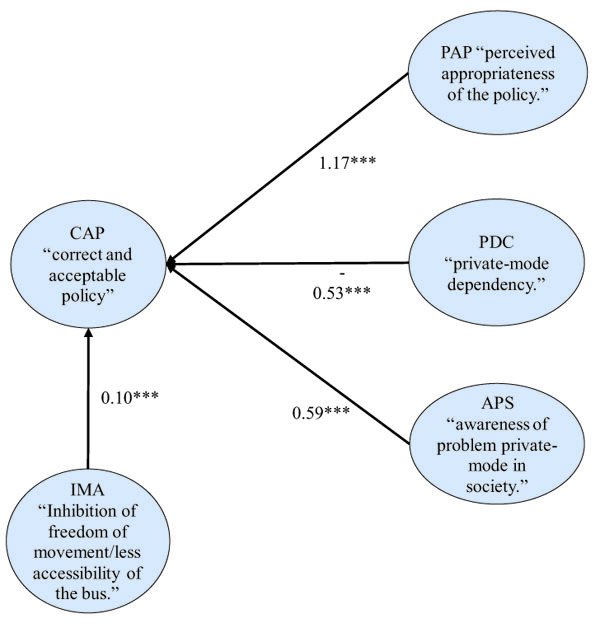 However, psychological determinants of “Private mode dependency (PDC)” and “Inhibition of freedom of movement/less accessibility of the bus (IMA)” are regarded as the most influencing factors for diminishing scheme acceptance. It means that people who rely on the private mode are less likely to be worried about the policy, and they may feel more inhibition of freedom of movement/less accessibility of the bus if the proposed policy would be applied. Furthermore, this result confirms our hypothesis mentioned in the introduction of this paper. That is a determinant of private mode dependency and inhibition of freedom of movement/less accessibility of the bus would have an adverse consequence on such intentions. Fig. (4). Diagram of SEM-CFA: Loading path among latent variables (all path coefficient significant at 1% error level). Our empirical results indicate that private mode dependency and less accessibility of the bus system has shown a fundamentally significant effect on the approval of the proposed scheme. This may partially be due to limited understanding of the benefit proposed scheme. In line with the study by Fujii and Van , Eriksson et al. , Fujii  and Gärling et al. it has been verified that the individual’s subjective indicators related to problem awareness, policy fairness, and perceived effectiveness are recognized as a vital aspect distressing the acceptability. The emotional intention related to infringement of freedom, policy fairness, problem awareness, and perceived effectiveness have directly and indirectly contributed to the acceptance of the policy of transport policy. Further confirmation revealed that unobserved factors namely recognition to the proposed policy, the fairness of the system, awareness to the congestion-related problems and inhibition of freedom of movement have the utmost significant encouragement on acceptance’s determinant [19, 22]. Therefore, promotion and increasing detailed knowledge on the merit prosed policy may need to be considered as recommended in [7, 22]. Moreover, the result of this study could provide valuable insight for the policymakers in designing effective and acceptable travel demand management policy in particular in the context of emerging countries such as Indonesia. Statistical Year Book of Banda Aceh 2018. Sugiarto S, Miwa T, Sato H, Morikawa T. Congestion charging: Influence of public consciousness on acceptability in Jakarta Metropolitan Area The 21st World Congress on Intelligent Transport Systems Detroit USA. 2014.2014. Ernst PJ. Initiating Bus Rapid Transit in Jakarta, Indonesia. Transp Res Rec 2005; (1903): 20-6. Susilo YO. T.B, Joewono, W. Santosa, and D. Parikesit, “A reflection of motorization and public transport in Jakarta Metropolitan Area. IATSS Res 2007; 31(1): 59-68. Shapiro RJ, Hassett KA, Arnold FS. Conserving energy and preserving the environment: The role of public transportation 2002. Public transportation: Benefits for the 21st century 2007. Fujii S, Van TH. Psychological Determinants of the Intention to Use the Bus in Ho Chi Minh City. J Public Transp 2009; 12(1): 97-110. Eriksson L, Garvill J, Nordlund AM. Acceptability of single and combined transport policy measures: the importance of environmental and policy specific beliefs. Transp Res Part A 2008; 42: 1117-28. Fujii S. Environmental concern, attitude toward frugality, and ease of behavior as determinants of pro-environmental behavior intentions. J Environ Psychol 2006; 26: 262-8. Gärling T, Fujii S, Gärling A, Jakobsson C. Moderating effects of social value orientation on determinants of pro-environmental behavior intention. J Environ Psychol 2003; 23(1): 1-9. Sugiarto S, Miwa T, Sato H, Morikawa T. Explaining differences in acceptance determinants towards congestion charging policies in Indonesia and Japan. J Urban Plann Dev 2017; 143(2): 1-12. Sugiarto S, Miwa T, Morikawa T. Inclusion of latent constructs in utilitarian resource allocation model for analyzing revenue spending options in congestion charging policy. Transp Res Part A 2017; 103: 36-53. Sugiarto S, Miwa T, Morikawa T. Recursive bivariate response models of the ex-ante intentions to link perceived acceptability among charge and refund options for alternative road pricing schemes. Transp Lett 2018; 10(1): 52-63. Joewono TB, Kubota H. User perception of private paratransit operation in Indonesia. J Public Transp 2007; 10(5): 99-118. Saleh SM, Sugiarto S, Hilal A, Ariansyah D. A study on the traffic impact of the road corridors due to flyover. AIP Conf Proc 2017; 1903: 060005. Louviere JJ, Hensher AD, Swait DJ. Stated Choice Methods Analysis and Applications 2000. Toşa C, Sato H, Morikawa T, Miwa T. Commuting behavior in emerging urban areas: Findings of a revealed-preferences and stated-intentions survey in Cluj-Napoca, Romania. J Transp Geogr 2018; 68: 78-93. Toşa C, Mitrea A, Sato H, Miwa T. Economic growth and urban metamorphosis: A quarter century of transformations within the metropolitan area of Bucharest. J Transp Land Use 2018; 11(1): 273-95. Jöreskog KG. A general approach to confirmatory maximum likelihood factor analysis. Psychometrika 1969; 34: 183-202. Brown AT. Confirmatory factor analysis for applied research 2nd ed. 2015.